I just started using the replication feature to do a server migration with minimal downtime. Is it expected behaviour that in a single replication job between 2 hosts with 15 VM's, all VM's are replicated sequentially? My proxies on both hosts are set to 4 concurrent tasks, so I would expect 4 replications happening at the same time. Is this some kind of limitation I have not found out about in the documentation? No, no WAN acceleration. 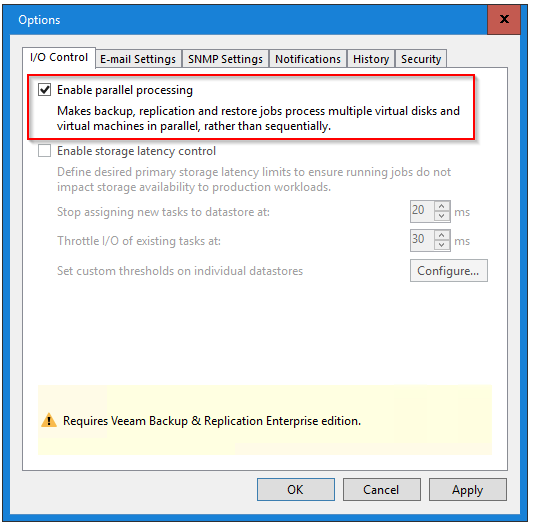 2 servers, standard edition of Veeam B&R, single subnet, one proxy per host. What about concurrent task value in the repository settings? Also, check the Parallel Processing checkbox in the General Options. Please keep in mind that 1 task = 1 VM disk, so if the VM has 4 disks, for example, it will consume 4 concurrent task slots for processing. Thanks! Ah, the Parallel Processing checkbox wasn't checked. That did the trick, thanks!